Let's get real... we are all busy! Busy with work, family, school, social lives, etc. Your health is not the "to do" item to put off! To help you we have a morning boot camp that will get you in the best shape of your life as well as a new training facility at www.sports-fitness-solutions.com that is unlike anything around! Make a decision and COMMIT one of our programs.... months from now you will realize it was the best decision you have ever made for not only yourself, but those who love and depend on you! Our next Winter Boot Camp is taking registrations now and is filling fast. Contact us at: 361-774-0874 or on line at www.sports-fitness-solutions.com on the "contact us page." Remember you can "Beat the Bulge" even during the holiday season; and I'm here to help. We look forward to speaking with you. Find following two articles I think you'll enjoy. Observing the current obesity epidemic, he knew that he wasn't alone. 1. An Irresistible Combination Rewires Your Brain: Think of your favorite treat - most likely it can be broken down into the basic building blocks of sugar, fat and salt. This combination is known of as the ‘three points of the compass', a combination that has been shown to literally alter the biological circuitry of your brain. 2. The Food Industry Targets You: Everywhere you go you'll see the clever work of the food industry, tempting you with highly palatable creations. Food has become a science, and your taste preferences the guiding light. "Foods high in sugar, fat, and salt, and the cues that signal them, promote more of everything: more arousal...more thoughts of food...more urge to pursue food...more dopamine-stimulated approach behavior...more consumption...more opioid-driven reward...more overeating to feel better...more delay in feeling full...more loss of control...more preoccupation with food...more habit-driven behavior...and ultimately, more and more weight gain." In order to resist overeating in today's tempting food environment, you must eat by a set of self-imposed rules. Predetermined rules take away the need to make food decisions in vulnerable moments. "Don't eat anything your great grandmother wouldn't recognize as food." Pay more, eat less. Look for quality of food over quantity. Eat meals. Cut out snacking, stick with structured meals. Don't get your fuel from the same place your car does. Gas stations are great for fueling your car, but the food they sell are not suited to fuel you. Those extra calories will accumulate around your waist. Your health will suffer. You will become more disappointed with your appearance. You'll feel sluggish. Give Yourself a Real Reward: The bottom line is that we eat unhealthy food as a reward, even though it causes more harm that good. It's time to give yourself a truly beneficial reward Exercise. Breakfast is the most influential meal of the day. If you start your day with sugary pastries or a greasy breakfast sandwich, the rest of your food choices will follow suit. However, when you start your morning with a wholesome and nutritious meal you'll be more likely to continue with good choices throughout the day. 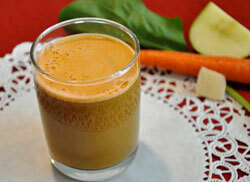 Try the Veggie Power Juice recipe below as a nutritious start to your day. Remember how Popeye would drain a can of spinach and half a second later his muscles would begin to bulge? Think of this recipe as your own can of spinach. While your muscles may not instantly grow to three times their size, your body will surely experience a nutritious surge. Wash the vegetables, cut the ends off the carrots and peel the ginger. Run each item through the juicer. Mix until combined, pour into two glasses and enjoy. Nutritional Analysis: One serving equals: 139 calories, .5g fat, 34g carbohydrate, .8g fiber, and 2g protein.